comment Book early to avoid disappointment! Le 58 Tour Eiffel is a tourist-style restaurant and your ticket includes a three-course set menu dinner with drinks. Although the choice is limited, the food is of a good quality and the views are unsurpassed. You will have the opportunity to stroll around the tower and enjoy the views before and during dinner and once you have finished your meal, you will be taken to your river cruise which departs from the base of the Eiffel Tower. 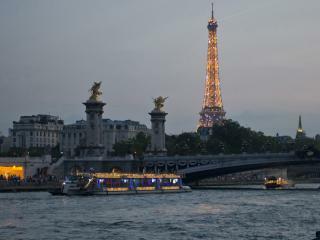 Set against a backdrop of the Paris Illuminations, including close-up views of the Eiffel Tower, Notre Dame Cathedral and the Louvre Museum, this leisurely one-hour cruise is the perfect way to end your evening. Drinks: Wine, mineral water, coffee Vegetarian option available on request. Please note, you will be seated with other tour guests at dinner – so although this is a memorable and very popular experience, it is not recommended for a private romantic evening. All guests will seated at tables of 6 - 8 people, a table for two is not available. There is not enough time allocated for visitors to go to the "top" of the Eiffel Tower. If you wish to visit the top of the Eiffel Tower it is recommended you visit on another day. 2 rue des Pyramides in central Paris - the nearest metro is Pyramides. Daily, year round. Does not operate 14th February; 14th, 26th July; 24th, 25th and 31st December. Around 4 hours including a 60-minute cruise. Advanced reservations are required. Please select your chosen date when booking. All guests will seated at tables of 6 - 8 people, a table for two is not available. Please note tour may operate in reverse without prior notice which may result in a later dinner sitting. There is not enough time allocated for visitors to go to the "top" of the Eiffel Tower. Queuing can take a long time, therefore it is suggested to return to the Eiffel Tower on another day.